There are piles of it. Everywhere. In corners and nooks and under cribs and beds and spilling out from over our unsorted laundry sorter. And yet, I'm always doing laundry. Or, maybe it's that I'm always thinking about the colossal piles of it and napping eating blogging staring at it instead. The final blow came when I realized I'd washed the same load three times this week because I can't stand that nasty smell when you dry a load that's been sitting in the washer too long. In any case, this Momma is totally overwhelmed by keeping our family of five in clean, folded, not-sitting-in-baskets laundry. Everyday? Two days a week? Alice from the Brady Bunch lives at your house? Throw in a load when everyone's out of clean underwear and wing it the rest of the time? Empathy welcome. Help greatly appreciated. Condemnation ignored. So sorry Alice has not stopped by to take your pain away. I do laundry every single day. I did not train my kids well and they use a fresh towel with every shower and never hardly wear the same thing twice without putting it in the wash. Hey, at least they are clean, right? I don't mind doing laundry, I just hate putting it away. It's always clean, fresh, and folded, but not always in it's right place. First of all, let me say that I have a Japanese size washing machine. Second, the Japanese do NOT have dryers. Yes, even during rainy season we hang our laundry except we hang it inside on hangers using the door frame. It's not that we're poor and trying to save money----this is just the way EVERYONE does it. I'll put a post on my Blog soon in the future. Now, given all that----here's what I do to tame the beast. 2. I wake up and start my washer as soon as I rise. The Japanese do have timers on their machines though so I can put the clothes in and have a wash ready to hang as soon as I wake up. 3. I do laundry EVERYDAY----rain or shine. Now, of course my situation is different considering the sheer number of people in our family plus the lifestyle of living in Japan with no dryer! My suggestion, think of me when doing laundry and pray a prayer of gratitude----"Thank You Lord for my dryer and the fact that I can wash a load of laundry at anytime of the day!" I have the same problem! As soon as I saw the picture on your blog this morning, I knew what was coming...it was so ME!!! : ) I keep telling myself every week that THIS WEEK, this week will be different! This week, I will do laundry EVERY day if I have to...this week, I will fold every load before I move on to something else...this week, I WILL NOT (under any circumstances!!!) allow a load to sit in the washing machine so that it's stinky and I have to wash it 3 times to get the stink out! Guess what...this week wasn't "THE" THIS WEEK...maybe next! : ) Hope you're able to tackle some laundry today...I hope to! Yes, laundry. I don't have a schedule, but I figure if I can get at least one load completely done a day, that's good. I usually have one in each station- the washer, the dryer, the pile to fold, and the folded basket. But then, if one gets folded and into drawers, yeah! Or some days, I just focus on laundry and pile it up and then do a super fold. I fold 2-4 loads, load them in the baskets, and set them at the bottom of the steps. Marc carries them up for me, and together, we put it all away. An ideal way? Is there really one? Every. Single. Day. I wash, dry, and fold. Then it gets stacked on a table in the laundry room, and each person is responsible for putting their own away. Sometimes it sits there for a week before I start yelling. I know that your kiddos are too small for that chore, but they can match socks! I could post exactly what Ginger posted. I have towel hooks in the bathroom just to encourage the kids to use a towel more than once, after all you are clean when you finally use it, but it doesn't happen and with 3 kids in sports and two teenagers that won't go to school in the morning without a shower we go through a TON of towels. The sports issue also adds to lots of changes of clothes hence lots of laundry. I have to do it everyday or it quickly becomes extremely overwhelming. When it gets out of control I spend the day doing none stop laundry and instead of folding it all I just separate it by child and they have to fold it themselves when they get home. That doesn't happen very often so when it does I don't get too much complaining because after all it is THEIR own clothes. I fold the laundry at the kitchen table and I put each person's laundry at their dinner spot and then the kids are responsible to put their own clothes away before dinner. That works really well for me and keeps me from having to go into their bedrooms and get more depressed to see the mess they have made out of their closets. LOL! I hope you get on top of it soon because I know how frustrating it is to see piles everywhere. oh girlfriend... just wait til those boys are older. your laundry woes will triple! i'm with ginger. i don't mind doing the washing. it's the putting away that never seems to get completely done in my house. it sits folded on my dryer, a table, or a chair in my bedroom. argh! most of the time i do a few loads on the weekend and then finish up on mondays. I actually do the exact opposite of Jennifer - I make sure the girls have enough clothing that they can go for 7-10 days without having to do laundry - including if they have to go through a day where they change once or twice (of course, this is why all of their clothes come from second-hand stores, outlet malls, or Target). The other thing I do is I separate the girls laundry from ours. I do all of theirs, say, on a Monday and then I do all of ours the following Monday. That way I'm only doing laundry once a week and it makes the amount I have to do MUCH more manageable. I also do it on a day that I'm going to be home all day long so that I can knock it out all in one day. This doesn't always happen, but it's the goal. Good luck - and may the Tide be with you. Yeah- I do it every day too. I don't mind doing it but I hate folding the white load. Just do 1 load every morning when you get up and you'd be amazed what a difference that makes in keeping up with it. Sorry the laundry fairies haven't been visiting your home lately. I do laundry 3 times a week. Monday's it's darks, generally 2 loads, Wednesday it's lights, and Friday it's my son Bug's laundry. I do additional loads as needed for sheets and "emergency laundry." I encourage using your towel a couple times before tossing it in the hamper (it was how I was raised) and both myself and my DH have been known to wear the same pair of pants/shorts twice before tossing them in the wash...that is if they don't have a funky smell. UGH - LAUNDRY! It has been my nemesis for years! I would let the clothes pile up until basically someone was out of underwear and had to do it. I don't mind the washing and drying it is the folding and getting it put away. About a year and a half ago I decided I needed to tackle my laundry problem and put myself on a little schedule. I didn't want to do a laundry schedule but it has made a HUGE difference. I do laundry on M,W,F - the loads are small and manageable to get washed, dried, and put away in the day. I always do towels on Monday so that is my big laundry day. I do sheets usually on the weekends or a T or TH when I don't have other laundry. We all have a second set of sheets so there is no pressure to get them washed/dried/back on beds. Morgan and Landon are both responsible for putting their laundry away - now their drawers may be a disaster and we organize them every few weeks to get a fresh start but hey they are learning and it is one less thing for me to do. Lance does his own laundry because well it stinks. He has a dirty job and ugh! I have also taught Morgan to hand wash all her own gymnastics leotards. Sorry that got long and probably way more info than you wanted/needed. Good luck! A load a day works for me; I wash it, dry it and fold it. Usaually it ends up sitting on the dryer folded and then I put it away the next day when I throw the next load into the wash. Audrey and JJ know where their clothes go; so they can help put away; I just put their piles on the floor by their dressers and they'll help with that. Alice threw up her hands and stormed out of my house a long time ago. I've tried every schedule known to man and I finally just started throwing in a load every night after dinner and it seems to keep the laundry monster pretty much at bay. I always try to look on the bright side. Yeah. 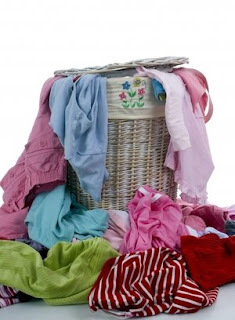 I think I've shared about my laundry issues on my blog. I'm not sure what happened, but somewhere a couple of years ago I lost complete control of the laundry and have not regained it. I have actually THIS WEEK vowed to get caught up. And so far so good. Although, I should be doing it now instead of commenting about it. Oh well. My hope is that once I get caught up, I can keep up with one small, manageable load each day. It sounded like Kristen had a pretty good system going! On an ideal week, I do laundry twice - Mondays and Thursdays. We invested in a HE washer, so I do 4 loads each time for my family of 4 -white, middle, dark and reds (my dd loves pink so I have a full red load). Like Jennifer Partin, I also have a tiny washer. I live in the UK; it's a washer/dryer combo and I don't use the dryer: it stinks when I use it, plus it isn't energy efficient and will only dry a fraction of an already small load in 40-60 minutes. I do have a dryer in my garage, but I usually plan my laundry around the weather (which is very hard to predict around here). I usually do 3-4 loads every other day. I never do it on weekends unless absolutely necessary, so often Monday is a 7-9 load day. That's 3-4 loads in American terms. If it's not truly dirty, refuse to wash it. My daughter thinks she can quickly clean her room by gathering up all the clothes that should be put away and tossing them back in the laundry hamper! HA! Like I won't notice! We use towels more than once and any other item until it's a bona fide dirty item (the exception is socks and underwear!). I thought it was bad when they were babies: let me tell you, it's worse when they're teenage boys who start to sweat. It's a whole set of clothes to wash every day just from one kid and they're much bigger than baby clothes! We are a family of 6, so there's always laundry piling up. To a point, you go easy on yourself especially when the kids are very young. But you can also implement a simply, not-so-frightening schedule of a load a day. Don't allow yourself to do more, except under special circumstances, and don't wash a new load until the last one is folded and put away. Just realized I never commented here - you've already got some great suggestions - I love JM's!! I try to collec the laundry out of the bedrooms when putting them to bed. Then I can throw a load in before breakfast and get it outside to dry, or on my drying racks inside. I usually do a lights and darks load back to back. On days when we aren't going anywhere, I do extra...especially if its nice and I can hang it all out. Each child has their own basket. Sometimes, but not always, I like to fold clothing and put it right into their baskets. The older 2 can carry it upstairs and put it in their drawers. Actually, they are better at it than I am. Our stuff sits on the floor for a while before it gets put away. Ugh, my least favorite house chore next to ironing. I would rather scrubs toilets....You know, I asked the women at my Bible Study the same question a couple of months ago when I told them that I was feeling overwhelmed with laundry. Before I would have a "laundry day", but all of the mom's who had 3+ kids said that they put in a load day. It was just getting too overwhelming to do it all at once and I would get scared opening the laundry room door. It's really helped my peace of mind doing it more frequently. But be gracious to yourself. With a nursing infant and two preschoolers and a husband who travels a lot for work, it's harder to keep a strict schedule. Enjoy these days of mismatched socks and "creative" outfits. I am learning to. You should have seen what Nathan wore to preschool on thursday...it was Garden Dress-up day, and he has on his camoflauge pants and a bright orange shirt that said "crazy monkey." LOL! And I felt no condemnation when I saw him standing next to the kids who were dressed as perfect little lady bugs but just smiled and was as proud as I could be. And I too have had to wash a load more than once b/c of the "mildew" smell. That I can't deal with either, only b/c the smell makes me want to hurl!